Cakebread and Walton's OneDice RPG system's espionage thriller installment for the Spies line is here. 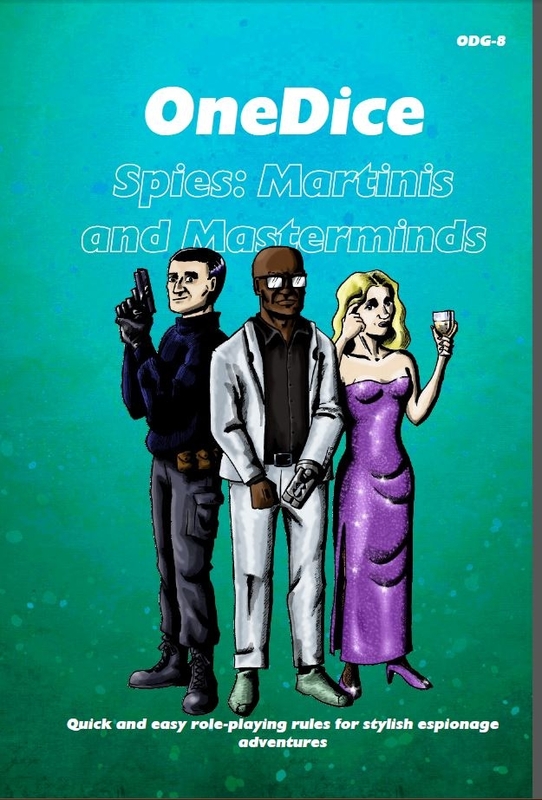 Welcome to OneDice Spies: Martinis and Masterminds, a game of daring and not-so-secret agents, charismatic megalomaniacs, international conspiracies and glamorous locations. It is a world that resembles our own of years gone by, but has taken one step smartly to the side; a world where killer satellites are launched into orbit with startling frequency and evil organisations can construct vast bases in the craters of extinct volcanoes without anyone noticing. Within the pages of this book you will find an in-depth look at the genre; all the rules you need to play; several ‘skins’ that present different ways to run OneDice Spies: Martinis and Masterminds; and, of course, a list of groovy gadgets. Pack your evening wear, ensure that there is a full clip in your Walther, and don’t forget the keys to the Aston, because it is time to enter the world of Martinis and Masterminds. Currently available in PDF. These are often quickly also available in print-on-demand format, as well. The OneDice system is a very light 1d6 game designed more for quick one shots or newer or younger players. There are several mini settings and genre books for the rules and many more are coming, it seems. Here's more information about OneDice.